This article is about a type of packaging. For the short film, see Plastic Bag (film). For the song, see Plastic Bag (Drake and Future song). 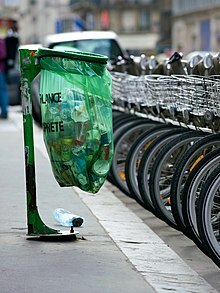 A plastic bag used to collect waste on a street in Paris. Most plastic bags are heat sealed at the seams, while some are bonded with adhesives or are stitched. Many countries are introducing legislation to phase-out lightweight plastic bags. Several design options and features are available. Some bags have gussets to allow a higher volume of contents, some have the ability to stand up on a shelf or a refrigerator, and some have easy-opening or reclosable options. Handles are cut into or added into some. Bags can be made with a variety of plastics films. Polyethylene (LDPE, LLDPE, etc.) is the most common. Other forms, including laminates and co-extrusions can be used when the physical properties are needed. Plastic bags usually use less material than comparable to boxes, cartons, or jars, thus are often considered as "reduced or minimized packaging". Depending on the construction, plastic bags can be suited for plastic recycling. They can be incinerated in appropriate facilities for waste-to-energy conversion. They are stable and benign in sanitary landfills. If disposed of improperly, however, plastic bags can create unsightly litter and harm some types of wildlife. Bags are also made with carrying handles, hanging holes, tape attachments, or security features. Some bags have provisions for easy and controlled opening. Reclosable features, including press-to-seal zipper strips, are common for kitchen bags bought empty and for some foods. Some bags are sealed for tamper-evident capability, including some where the press-to-reseal feature becomes accessible only when a perforated outer seal is torn away. Boil-in-bags are often used for sealed frozen foods, sometimes complete entrees. The bags are usually tough heat-sealed nylon or polyester to withstand the temperatures of boiling water. Some bags are porous or perforated to allow the hot water to contact the food: rice, noodles, etc. Bag-in-box packaging is often used for liquids such as box wine and institutional sizes of other liquids. Plastic bags are used for many medical purposes. The non-porous quality of plastic film means that they are useful for isolating infectious body fluids; other porous bags made of nonwoven plastics can be sterilized by gas and maintain this sterility. Bags can be made under regulated sterile manufacturing conditions, so they can be used when infection is a health risk. They are lightweight and flexible, so they can be carried by or laid next to patients without making the patient as uncomfortable as a heavy glass bottle would be. They are less expensive than re-usable options, such as glass bottles. Moderate quality evidence from a 2018 systematic review showed that plastic wraps or bags prevented hypothermia compared to routine care, especially in extremely preterm infants. Flexible intermediate bulk containers are large industrial containers, usually used for powders or flowables. Open bags with carrying handles are used in large numbers. Stores often provide them as a convenience to shoppers. Some stores charge a nominal fee for a bag. Heavy-duty reusable shopping bags are often considered environmentally better than single-use paper or plastic shopping bags. Because of environmental and litter problems, some locations are working toward a phase-out of lightweight plastic bags. American and European patent applications relating to the production of plastic shopping bags can be found dating back to the early 1950s, but these refer to composite constructions with handles fixed to the bag in a secondary manufacturing process. The modern lightweight shopping bag is the invention of Swedish engineer Sten Gustaf Thulin. In the early 1960s, Thulin developed a method of forming a simple one-piece bag by folding, welding and die-cutting a flat tube of plastic for the packaging company Celloplast of Norrköping, Sweden. Thulin's design produced a simple, strong bag with a high load-carrying capacity, and was patented worldwide by Celloplast in 1965. From the mid-1980s onwards, plastic bags became common for carrying daily groceries from the store to vehicles and homes throughout the developed world. As plastic bags increasingly replaced paper bags, and as other plastic materials and products replaced glass, metal, stone, timber and other materials, a packaging materials war erupted, with plastic shopping bags at the center of highly publicized disputes. In 1992, Sonoco Products Company of Hartsville, SC patented the "self-opening polyethylene bag stack". The main innovation of this redesign is that the removal of a bag from the rack opens the next bag in the stack. The number of plastic bags used and discarded worldwide has been estimated to be on the order of 1 trillion annually. The use of plastic bags differs dramatically across countries. While the average consumer in China uses only 2 or 3 plastic bags a year, the numbers are much higher in most other countries: Denmark: 4, Ireland: 20, Germany: 65, USA: > 300, Poland, Hungary, Slovakia: more than 400. A large number of cities and counties have banned the use of plastic bags by grocery stores or introduced a minimum charge. In September 2014, California became the first state to pass a law banning their use. Local manufacturers of plastic bags, under the legislation, would receive financial support to assist them make more durable multi-use bags, that would be sold by grocery stores rather than given away, as were the plastic bags. In India, government has banned use of plastic bags below 50 microns. In 2018, Montreal, Canada, also banned plastic bags with Ottawa expected to also put the ban into effect. Non-compostable plastic bags can take up to 1000 years to decompose. Plastic bags are not capable of biodegradation but rather they photodegrade, a process by which the plastic bags are broken down into smaller toxic parts. In the 2000s, many stores and companies began to use different types of biodegradable bags to comply with perceived environmental benefits. Plastic bags don't do well in the environment, but several government studies have found them to be an environmentally friendly carryout bag option. According to the Recyc-Quebec, a Canadian recycling agency, "The conventional plastic bag has several environmental and economic advantages. Thin and light, its production requires little material and energy. It also avoids the production and purchase of garbage/bin liner bags since it benefits from a high reuse rate when reused for this purpose (77.7%)." Government studies from Denmark and the United Kingdom, as well as a study from Clemson University, came to similar conclusions. Even though the bags are plastic, you typically cannot recycle them in your curbside recycling bin. The material frequently causes the equipment used at recycling plants to jam, thus having to pause the recycle machinery and slow down daily operations. However, plastic bags are 100% recyclable. To recycle them. you need to drop them off at a location that accepts plastic film. Usually, this means taking them back to the grocery store or another major retail store. Thin conformable plastic bags, especially dry cleaning bags, have the potential for causing suffocation. About 25 children in the United States suffocate each year due to plastic bags, almost nine out of ten of whom are under the age of one. This has led to voluntary warning labels on some bags which pose a hazard to small children. ^ "Life Cycle Inventory of Packaging Options for Shipment of Retail Mail-Order Soft Goods" (PDF). April 2004. Archived from the original (PDF) on 17 December 2008. Retrieved 15 December 2008. In June 2009 Germany’s Institute for Energy and Environmental Research concluded that oil-based plastics, especially if recycled, have a better life-cycle analysis than compostable plastics. They added that "The current bags made from bioplastics have less favourable environmental impact profiles than the other materials examined" and that this is due to the process of raw-material production. ^ Lapidos, Juliet (27 June 2007). "Slate Explainer, 27 June 2007". Slate.com. Retrieved 7 July 2010. ^ "Teresa Platt Commentary, Plastic Bags on Our Backs, May 2008". teresaplatt.com. Retrieved 7 July 2010. ^ Mieszkowski, Katharine (10 August 2007). "Plastic bags are killing us". Salon.com. Retrieved 23 April 2013. ^ McCall, Emma M.; Alderdice, Fiona; Halliday, Henry L.; Vohra, Sunita; Johnston, Linda (February 2018). "Interventions to prevent hypothermia at birth in preterm and/or low birth weight infants". The Cochrane Database of Systematic Reviews. 2: CD004210. doi:10.1002/14651858.CD004210.pub5. ISSN 1469-493X. PMID 29431872. ^ European Plastics News: Plastic T-Shirt Carrier Bag (1965). 26 September 2008. Retrieved 17 April 2012. ^ "Plastic as a Resource". Clean Up Australia. Retrieved 6 June 2017. ^ Cardoni, Salvatore (30 November 2010). "Half Sacked: Chinese Plastic Bag Use Drops by 50 Percent". Take Part. Retrieved 6 June 2017. ^ "Centre bans plastic bags below 50 microns - Times of India". The Times of India. Retrieved 22 January 2017. ^ Turnbull, Jay (31 December 2017). "What you need to know about Montreal's plastic bag ban". CBC News. ^ Wilder, Sam (June 2006). "Festival food recycling: Sun, fun and diversion". BioCycle. 47 (6): 30. ^ Xanthos, D., Walker, T. R. (2017). International policies to reduce plastic marine pollution from single-use plastics (plastic bags and microbeads): a review. Marine Pollution Bulletin, 118(1-2), 17-26. ^ a b Wagner, Jamey. "The Effects of Plastic Bags on the Environment". Health Guidance. healthguidance.org. Retrieved 19 March 2018. ^ Schuyler QA, Wilcox C, Townsend K, Hardesty BD, Marshall NJ (2014). "Mistaken identity? Visual similarities of marine debris to natural prey items of sea turtles". BMC Ecol. 14: 14. doi:10.1186/1472-6785-14-14. PMC 4032385. PMID 24886170. ^ "Animals Eat Ocean Plastic Because it Smells Like Food". 9 November 2016. Retrieved 15 February 2018. ^ "Environmental and Economic Highlights of the Results of the Life Cycle Assessment of Shopping Bags" (PDF). Recyc-Quebec. December 2017. ^ "Life Cycle Assessment of grocery carrier bags" (PDF). Denmark Environmental Protection Agency. February 2018. ^ "Life cycle assessment of supermarket carrier bags: a review of the bags available in 2006" (PDF). United Kingdom Environment Agency. ^ "Life Cycle Assessment of Grocery Bags inCommon Use in the United States". Clemson University. 2014. ^ "How to Recycle Plastic Bags". Earth911.com. Retrieved 22 February 2019. ^ "Find a Drop Off Location". Plastic Film Recycling. Retrieved 22 February 2019. ^ "Children Still Suffocating with Plastic Bags". US Consumer Product Safety Commission. Archived from the original on 14 July 2010. Retrieved 7 July 2010. "Children Still Suffocating with Plastic Bags" (PDF). Consumer Product Safety Alert. U.S. Consumer Product Safety Commission. Archived from the original (PDF) on 16 August 2000. Wikimedia Commons has media related to Plastic bags.